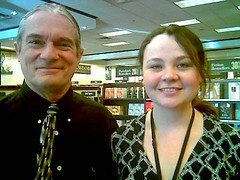 Today, I’ll be at a Fort Worth Barnes & Noble, 4801 Overton Ridge Blvd. I’m scheduled to sign at 2:00 p.m. but will get there early and either do some work or begin signing early. From there, I’d like to go see my parents in Kemp, Oklahoma, but I’ll have to see how the signing goes.